Coach Wayne Kreklow says freshman Sydney Deeken (14) plays big at the net. Coming off of a stomach injury, freshman outside hitter Sydney Deeken performed strong in her first few starts and adds another offensive tool for the Tigers. KBIA Sports’s Joyce Peng reports on Deeken’s improvements so far in college and some qualities and skills she brings to the team. Missouri faced a challenging Lipscomb team in its season home opener Friday afternoon at the Hearnes Center. The Tigers lost their first match in the Tiger Invitational to the Lipscomb Bisons, 3-1 (21-25, 25-20, 20-25, 23-25). They are 2-2 overall this season. For the Southeastern Conference volleyball champions, this season is all about experimenting and taking on new challenges. 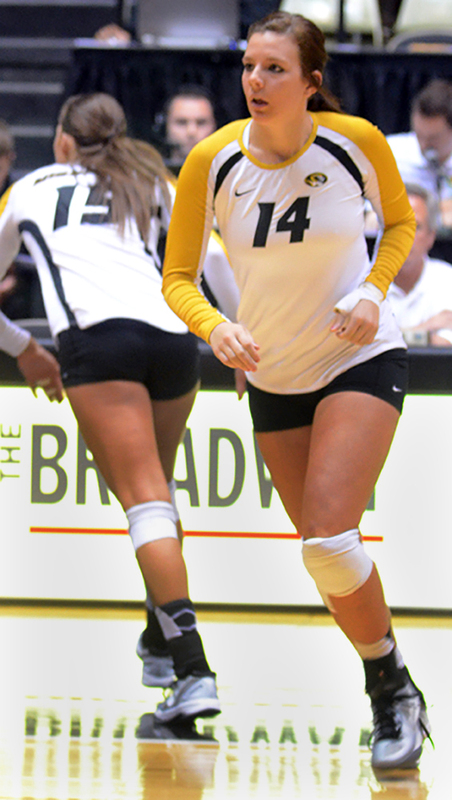 The Missouri volleyball team, which shocked many last year with its 35-1 record, still needs to establish an identity going into this season, coach Wayne Kreklow said at Wednesday’s media day session. Last year the Missouri volleyball team captured the university’s first SEC championship, finishing 18-0 in the conference, 35-1 overall, with the team’s one loss coming in the second round of the NCAA tournament. 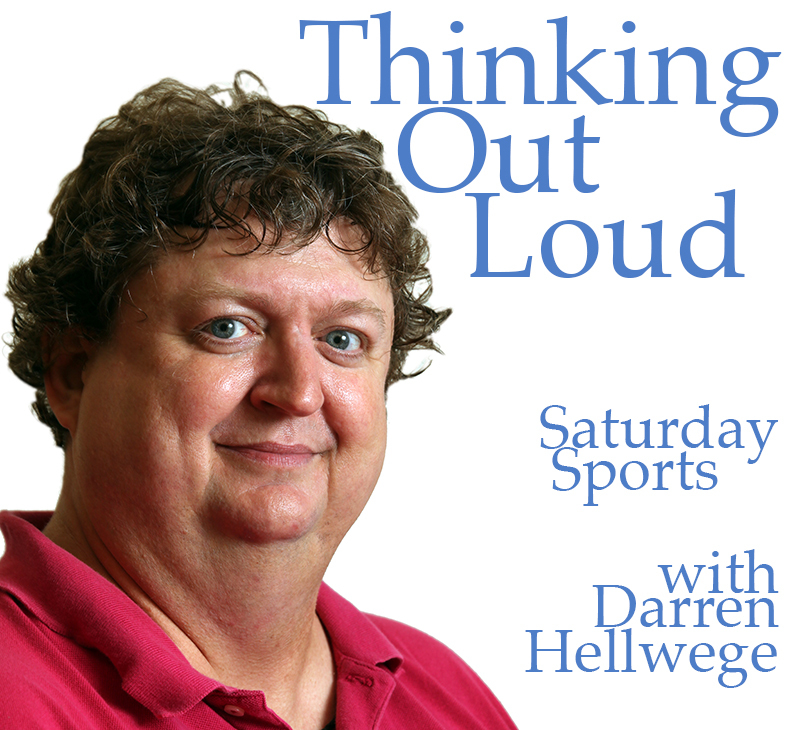 KBIA’s Darren Hellwege talks with coach Wayne Kreklow about the upcoming season. The team is young at many key positions this year and will be looking for strong contributions from two freshmen to replace four-year starters Lisa Henning Molly Kreklow. Wayne Kreklow anticipates using more players in more different positions than he’s done in previous years. The Tigers host the annual Black and Gold Game Wednesday evening at 6:30 at the Hearnes Center. The season starts Aug. 29 at the North Texas Tournament with the first home games coming in the Tiger Invitational, Sept. 5 and 6 at Hearnes. 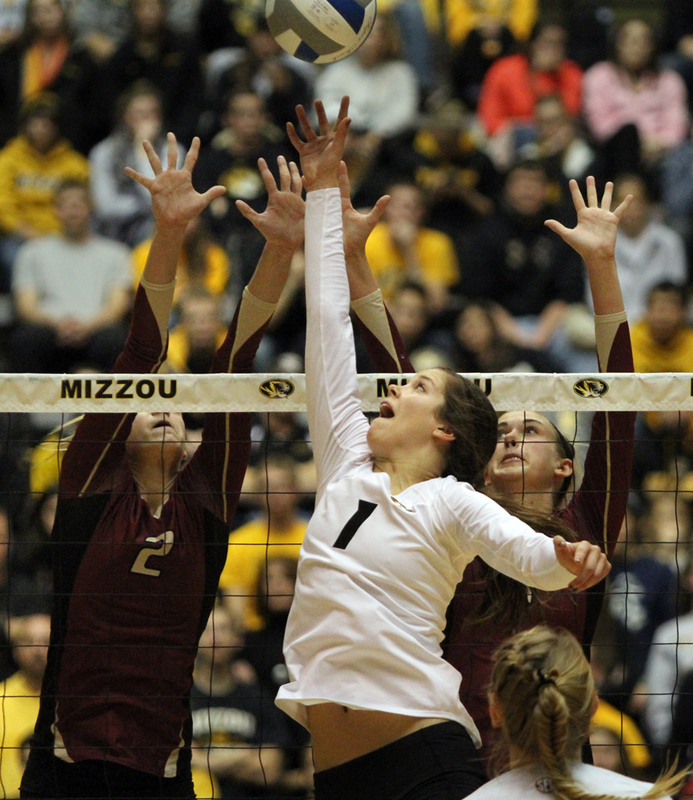 Missouri’s Molly Kreklow (1) makes a play at the night against IUPUI defenders. Kreklow finished with 41 assists in Friday’s game. 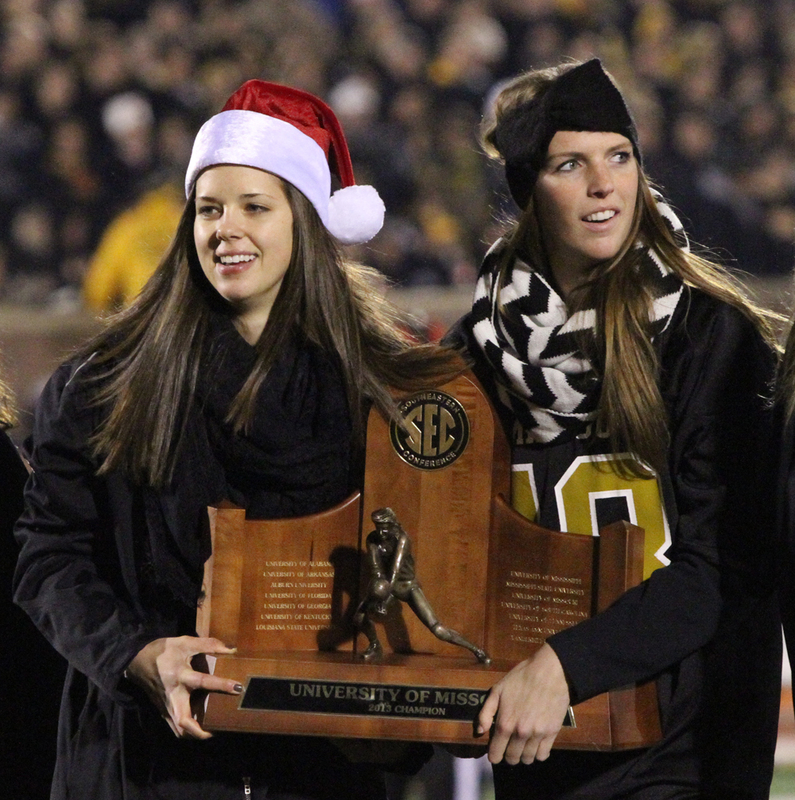 Molly Kreklow, left, and Lisa Henning show off the volleyball team’s SEC championship trophy Saturday, Nov. 30, 2013, at the Missouri football game. Both players have been named to the All- SEC team. Photo by Karen Mitchell. Senior Molly Kreklow was named Southeastern Conference player of the year it was announced today by the conference. Carly Kan was selected as freshman of the year. and coach Wayne Kreklow — Molly Kreklow’s uncle — was named coach of the year. In a few short hours the undefeated Missouri volleyball team will learn its fate in the 2013 NCAA Women’s Volleyball Tournament. Tiger fans can join the team at a watch party at the Clinton Club inside the Mizzou Arena starting at 7:30. While in theory anything can happen the Tigers, ranked No. 5 in the latest RPI, are almost certain to host the early round games in Columbia December 5-7. Missouri Associate Athletic Director Sarah Reesman told me that Missouri applied to host a regional some weeks ago, and that preparations have been complete for some time for Columbia to host a regional. 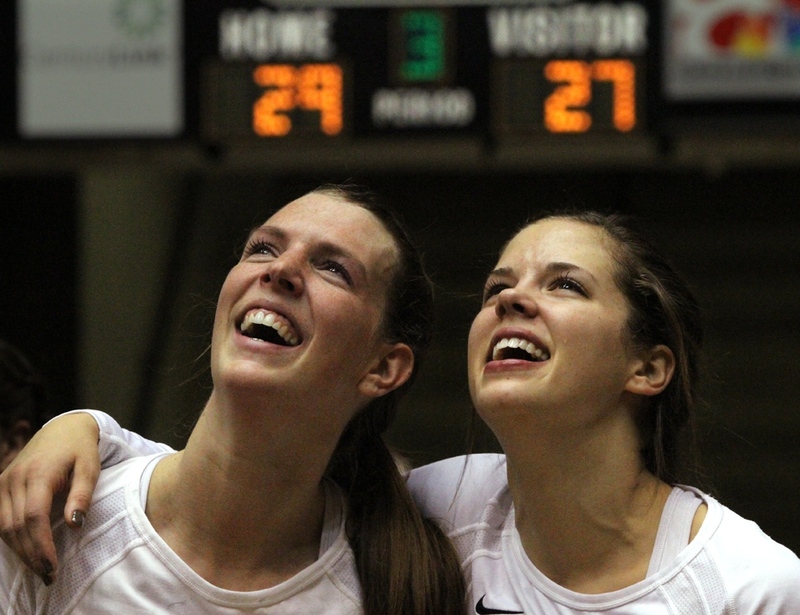 Seniors Lisa Henning, left, and Molly Kreklow watch a video of their career highlights after Wednesday’s game. The score on the board is from the third match against Arkansas. Friday night was the perfect end to a perfect season for the Tigers volleyball team. Seniors Molly Kreklow and Lisa Henning led the No. 4 Missouri Tigers to another victory and completing the season a perfect 34-0.